Over time, Gallus became suspicious of Mercer's behavior. Mercer, in turn, became aware of Gallus' scrutiny. Though he was unable to find hard proof, Gallus became convinced that Mercer was responsible for desecrating the Twilight Sepulcher and stealing the Skeleton Key. Before he could dig any further, Mercer arranged a meeting, where he betrayed and murdered Gallus. 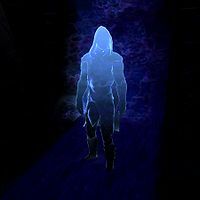 Gallus' spirit became the last of the Nightingale Sentinels and defended the Sepulcher alone for about 25 years. When Mercer Frey was finally defeated around 4E 201, Gallus was released from this duty by Nocturnal and allowed to become one with the Evergloam. ^ a b c d Events of Skyrim.